Georgia Power's interim assessment agreement with Westinghouse has been extended until 3 June, after which Southern Nuclear and Georgia Power will take over project management for the Vogtle AP1000 nuclear power plant construction project under a new service agreement. Southern Company subsidiary Georgia Power announced on 12 May that the companies had "in principle" reached an agreement allowing for the transition of project management from Westinghouse to Southern Nuclear and Georgia Power once the current engineering, procurement and construction (EPC) contract has been rejected in Westinghouse's bankruptcy proceeding. Construction work at the two US sites where AP1000s are under construction - Vogtle, in Georgia, and Scana Corporation and Santee Cooper's VC Summer, in South Carolina - has been continuing under interim assessment agreements set up following Westinghouse's 29 March filing for reorganisation under Chapter 11 of the US Bankruptcy Code. Both agreements have since been extended beyond their original 30-day term. Georgia Power's interim assessment agreement will now remain in place until 3 June while the new service agreement is finalised and all approvals are obtained, the company said. During this time, work will continue at the site and an "orderly transition of project management" will begin. The company said it will "take all actions necessary to hold Westinghouse and Toshiba accountable for their financial obligations". 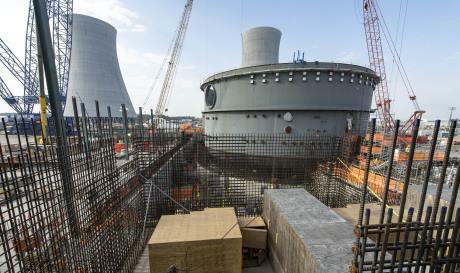 Construction of Vogtle unit 3 began in March 2013 and unit 4 in November the same year, with commercial operation scheduled for December 2019 and September 2020, respectively. The project is majority owned by Georgia Power (45.7%), with co-owners Oglethorpe Power (30%), MEAG Power (22.7%) and Dalton city (1.6%). The units will be operated by Southern Nuclear Operating Company. The Waynesboro site is also home to two operating pressurised water reactors.